Published: Jun 3, 2016 to ? Upon successfully capturing all of the elusive Clow Cards and transforming them into her very own Sakura Cards, Sakura Kinomoto finds her duty as Cardcaptor complete. On the way to her first day of classes at Tomoeda Middle School, Sakura is surprised by a reunion with her sweetheart Shaoran Li, who informs her that he is permanently moving back to Tomoeda. To her delight, Shaoran will also be attending the same school! Although her life seems brighter than ever, Sakura has a strange dream later that night where she is surrounded by transparent cards and meets a mysterious cloaked figure. To her horror, the Sakura Cards have all turned clear upon waking up, and her dream now reality. 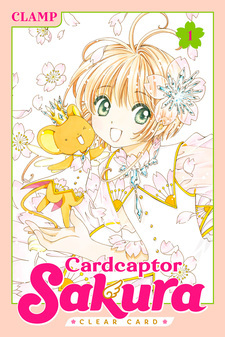 With ongoing prophetic dreams, a new staff, and encounters with a new set of cards, Sakura must once again take up the role of Cardcaptor alongside her guardians and friends in a whole new adventure. 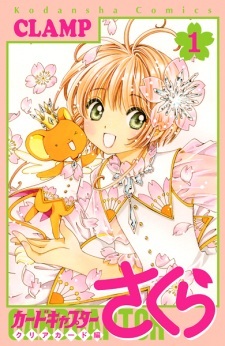 Cardcaptor Sakura: Clear Card-hen is published in English by Kodansha Comics USA; digitally since June 30, 2017, and physically since December 19, 2017. It has been licensed in Spanish by Norma Editorial.